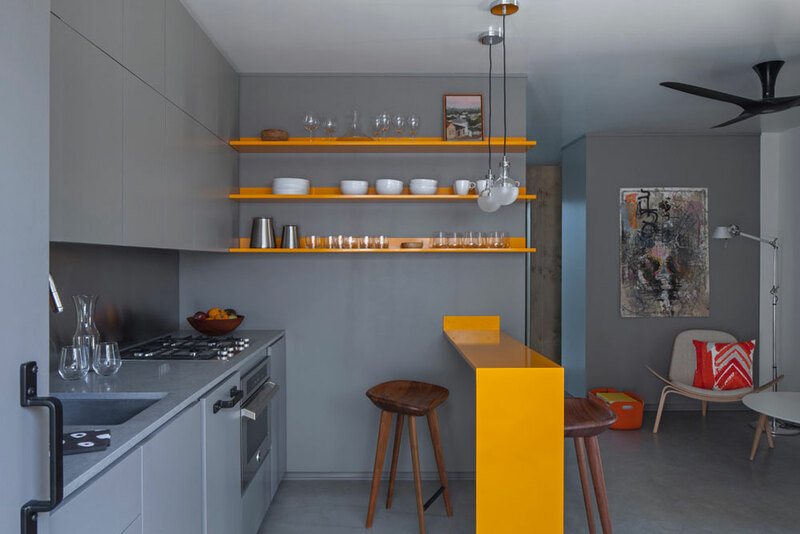 The somber darkness of this kitchen’s color palette is hit with the bright energy of yellow at two points in the room. A jet black wall holds cabinetry with a black veneer finish and black countertops. This wall is broken up with a brilliant yellow accent area. 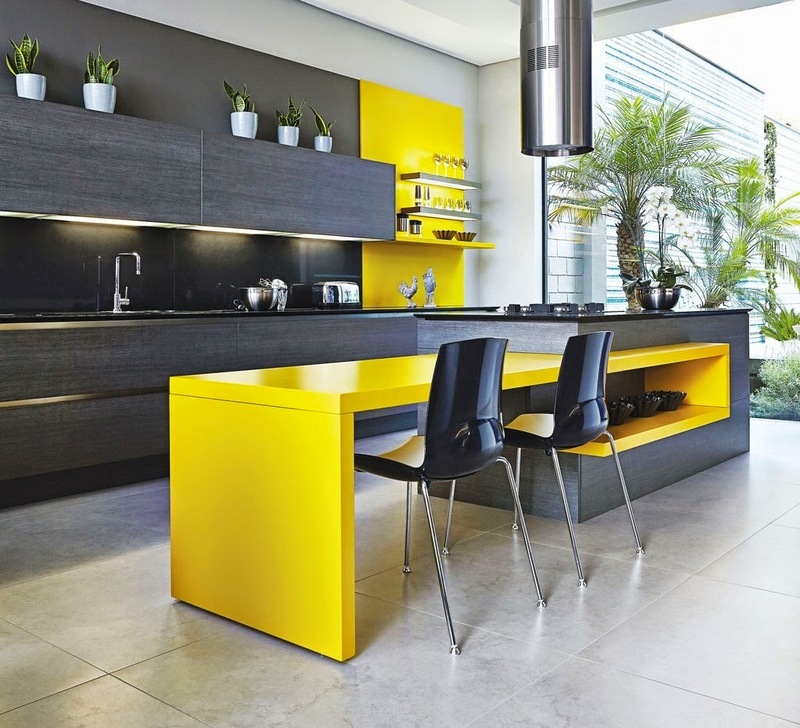 The kitchen island features this same yellow highlight in a dining area built into its side. Both yellow features are painted with a high gloss paint to raise the energy level even more. Beautiful creamy marble floor tiles lend a nice contrast to the dark cabinets and bright highlight pieces. The design is an excellent example of the use of two contrasting intensity levels in one space. Like many other modern kitchen ideas, this space makes the island the focus of the room. Cream-colored storage areas are cleverly tucked into the side wall to save space while retaining functionality and the same cream color is on the back wall round-edge cabinetry. The designer was cautious not to use a color scheme that would detract from the real feature of the room: the wishbone leg kitchen island. 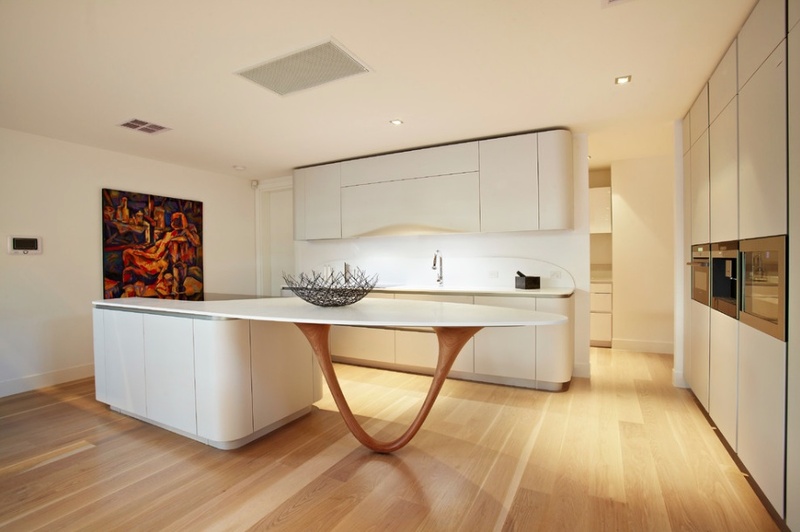 While the island could have been a basic polygon shape, the designer chose to use a gorgeous piece of wood sculpted into a wishbone shape as the leg of the island’s right side. The cedar tone finish of this beautiful wood piece blends amazingly well with the blonde floor boards to create a flow of wood grain through the room. Efficient use of space as a design element is fundamental when modern kitchen designs must also take into account the utility of the space. 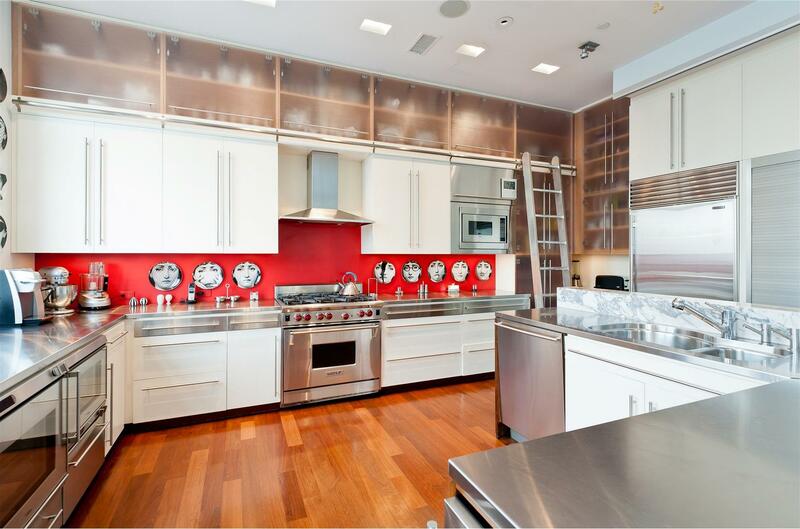 This full chef’s kitchen demonstrates how a space can keep its full functionality without sacrificing design quality. The skillful use of space above and to the side of everyday cabinetry allows the user of the space to have all of their tools on hand, but incorporates glass cabinet faces to provide a contrast to the wall cabinets. Adding a rolling library-style ladder allows the chef easy access to anything he or she might need. The stainless steel appliances take up a large portion of this kitchen, but the use of the stainless steel countertops helps to keep them blended with the design. The bright red backsplash adds a nice pop of color in an environment that might otherwise look sterile while vintage-style plates hung on this backsplash adds some emotion to the scene. This design shows that gray is anything but drab when used in the right design. The slate-gray tone flows from cabinets to walls to floor. Light orange wall shelving and a mini-island add just a bit of vitality to the design while adding space for storage and a small dining area. A stainless steel backsplash melds with the gray countertop while a small area of stained wood above the sink adds just the right amount of wood grain to accent the wall. A set of two half-frosted globe style pendant light finish the look and provide a delicate source of light for the dining bar. Lacquered white upper cabinets and dark matte finish lower cabinets in this kitchen help to draw the eye down and toward the unique island front. The high-gloss countertop on the island provides a beautiful frame for the splash design laser-cut screen on its front side. The coloring of the screen matches the coloring of the kitchen’s lower cabinets pulling everything together. To avoid drawing attention away from the island’s design feature, the designer has used recessed lighting in the room and a partially-dropped ceiling with backlighting for a bit more glow. A mirror backsplash also helps to reflect natural light to keep the space bright. 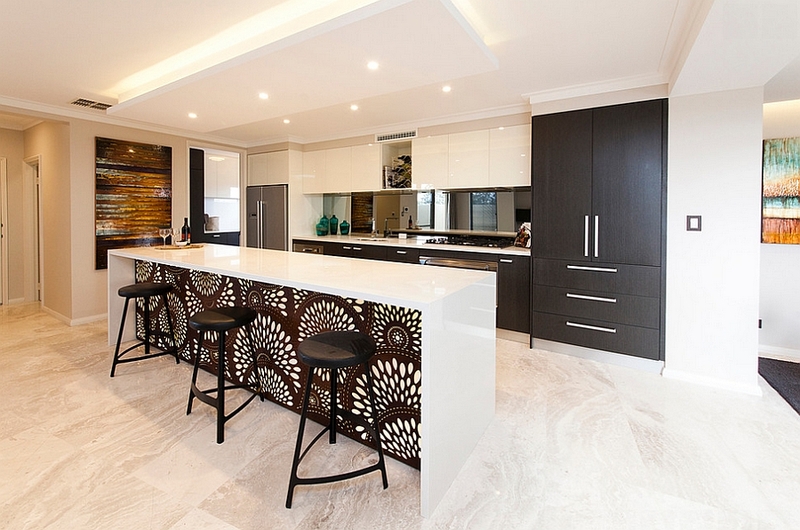 The three-dimensional technique used in this kitchen design layers different materials together to form a stacked effect. This technique begins at the ceiling where different rounded dimensions drop toward the floor in increasingly lower spirals. This spiraling approach ends at its lowest point with the stainless steel range hood and the stainless steel pendant light fixture. Another set of dimensions winds its way upward with the island cabinets. Cabinet layers are stacked with a marble countertop, then a lovely wood piece which juts out to serve as a seating area. This is then topped with a slick-top bar which runs the length of the island providing space for entertaining. The designer has also used this stacking technique in the color palette. 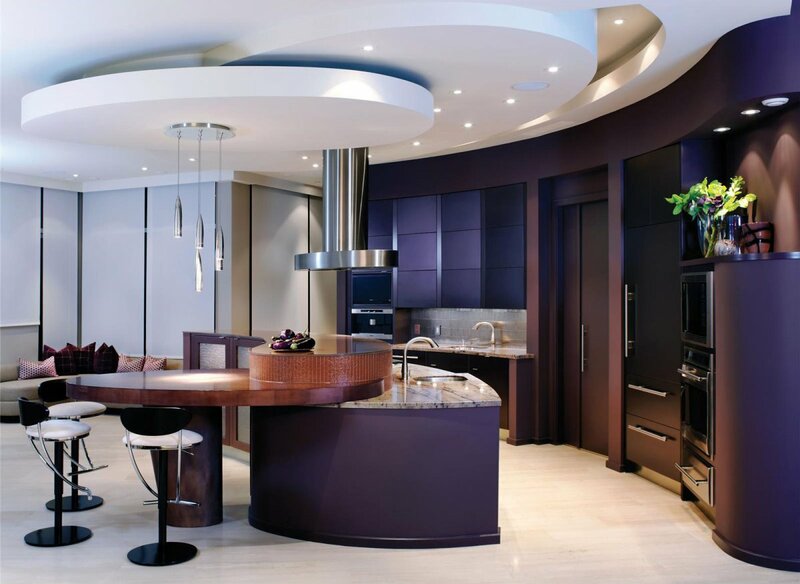 Different shades of violet stack together throughout the back wall with different hues on walls and cabinet faces. The stacked dimensions in this design show that the concept of layering is not reserved only for clothing. The minimalism in this design ensures that the creative kitchen island is the focal point of the room. Basic white walls, cabinets, and flooring follow the rules of minimalism making the kitchen island seem gargantuan in the space. 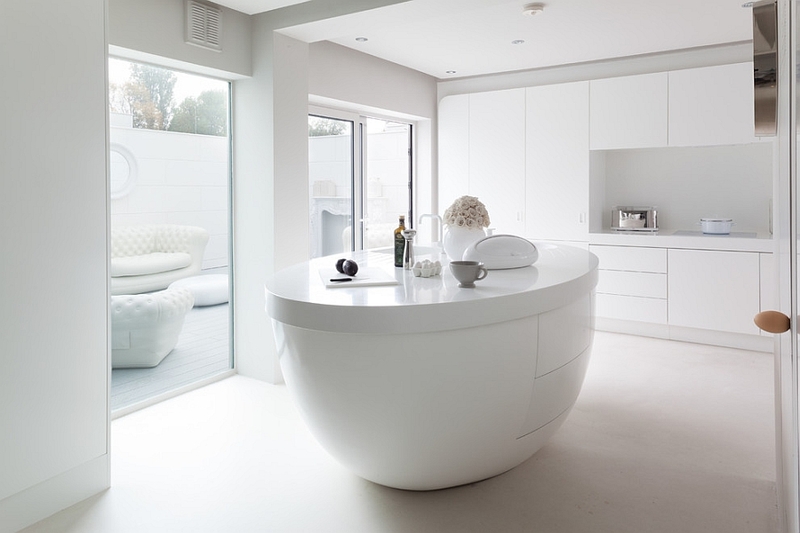 The teacup shape of this kitchen island is truly unique, but the incorporation of storage space and a sink ensure that it also serves a utility purpose. The minimalist design is carried onto the outdoor patio to make certain the large windows do not allow any non-minimalist design elements to bleed in. 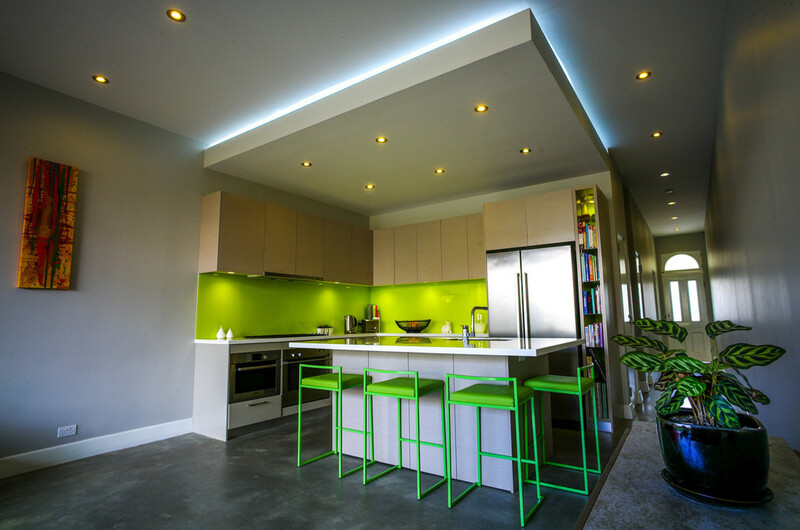 The bright lime green accent color of this space pulls in the eye and makes the space seem larger. Lightly finished cabinet faces make a nice boundary between the gray-blue wall color and the green backsplash. A lack of counter space has been aided by adding a large kitchen island which also serves a purpose as a seating area. The nearly-neon island stools draw more of the wall’s accent color out into the room. Gray walls outside the space and on the front of the island are an excellent complement to the brightness of the green. A dropped ceiling with backlighting helps to keep the space separated from the rest of the open floor plan. 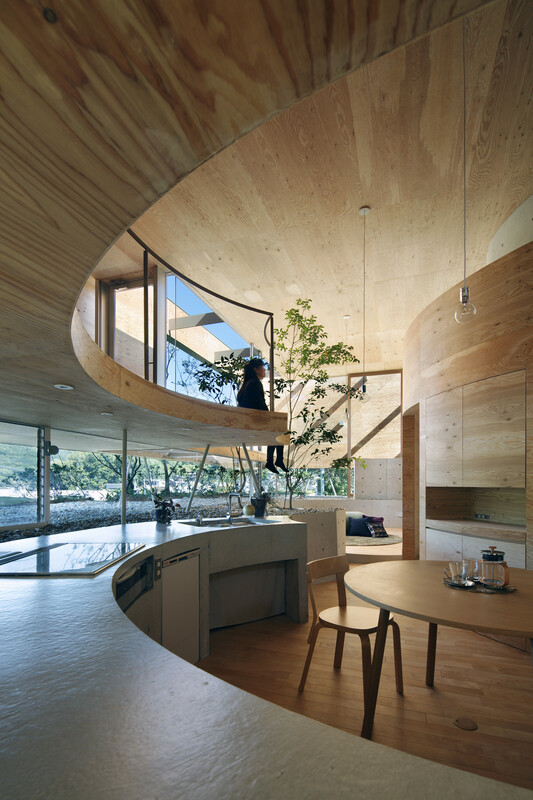 The circular shape of this room is meant to provide a feeling of protection. Cedar-paneled walls wrap around the space like a warm hug. A wooden cat walk from the loft level above extends above the kitchen counter area. Slate-gray countertops are composed of a rippled painted concrete surface. The area behind the kitchen counter serves as a rock-filled planter where trees grow within the living space. Plenty of natural light flows in from the multi-level plate glass windows, but simple clear globe pendant lights provide more than sufficient light at nighttime.